National Machinery Exchange has an extensive history in the bar processing industry from complete ferrous and non-ferrous bar and rod mills to single bar processing equipment like draw benches, straighteners, cold bar finishing equipment, bar peelers, EAF furnaces, roughing stands, Blooming mills, reber mills, merchant mills, section mills, straightening presses, bar mill stands, hand mills, and more. National Machinery Exchange has a wire and fastener division; click here for our wire and fastener equipment. 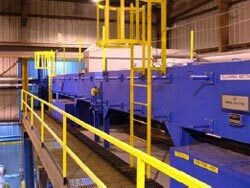 Contact us with all your bar processing machinery needs.